Demega formulations India is involved in offering excellent quality medicines to our most valued clients. Our offered products are widely appreciated by our clients which are situated all round the world. Vaccines are actually very safe,Most vaccine adverse events are minor and temporary. Demega formulations India is a prime exporter of Typhoid Polysaccharide Vaccine developed to prevent typhoid fever caused by Salmonella typhi (bacteria). 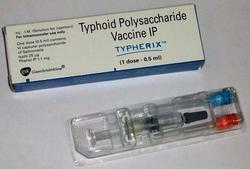 Vi capsular polysaccharide vaccine is licensed for use from age two years and older and boosters are required every three years,marketed in USA by brand name"Typhim Vi and Typherix". Ty21a live vaccine - licensed for use from age six years and older with Boosters every 5 years,The vaccine must be stored at 2 to 8 °C, but will retain its potency for 14 days at 25°Cmarketed in USA by brand name"Vivotif". Demega formulations India is a prime exporter of "VERORUB(Anti rabies)" a Prefilled Rabies Vaccine recommended for both Pre and Post exposure of the wound .Cleanning of the wound with soap and water immediately.---Vaccinate as soon as possible after exposure . "VERORUB(Anti rabies)" vaccination-has proven safety in Infants, Children, adults and Trimester of pregnancy. Anti rabies vaccine is marketed worldwide by name "Rabipur". Demega formulations India is a major exporter of Anti Thymocyte Globulin Vaccine used for allograft rejection in renal transplant patients. 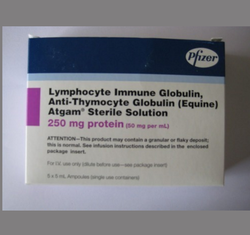 ATGAM is indicated for aplastic anemia in patients unsuitable for bone marrow transplantation. Patients receiving ATGAM show significantly higher improvement rate compared to standard supportive care at 3 months Improvement is defined in terms of sustained increase in peripheral blood counts and reduced transfusion needs. Looking for Vaccines Medicine ?